In the 1990s the French deconstructionist Jacques Derrida developed the idea of a Hauntology – the notion that the present and the future are inevitably haunted by monsters and ghosts from the past. 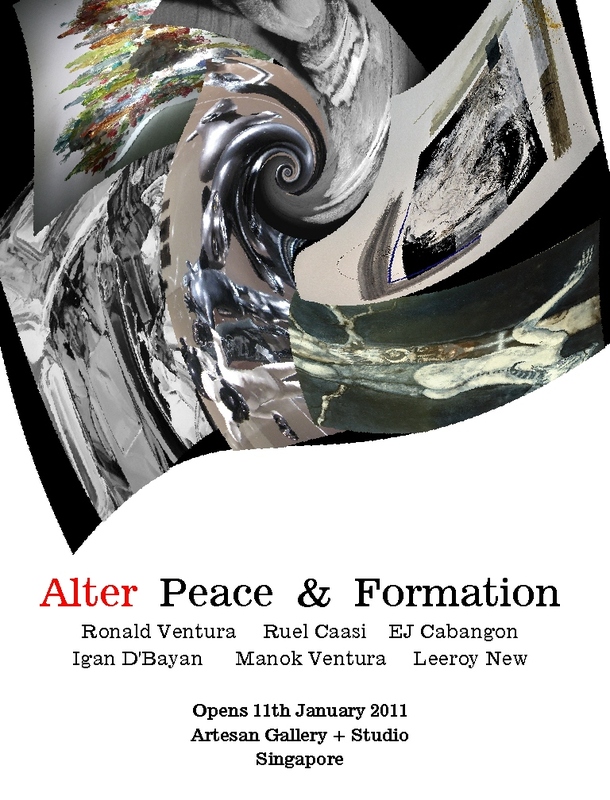 In Alter Peace & Formation, Artesan Gallery’s first exhibit for 2011, six young Filipino artists – Ruel Caasi, EJ Cabangon, Igan D’Bayan, Leeroy New, Manok Ventura and Ronald Ventura, embrace the spectres that haunt. They wrestle with ghosts, internal demons and dark personal visions to demonstrate how our shiny now is also tainted with the dread, decay and disillusion of their own experiences. “Alter Peace” recalls the word “Altarpiece”. An altarpiece is a work of art, normally a painting or sculptural relief of a religious subject, that is made to sit atop the sacred place where liturgical ceremonies take place. Although altarpieces are most associated with the Christian church, they significantly predate that religion and appear in the traditions of many other belief systems. All of them illustrate a belief that conveys that society’s shared vision of the world. In this exhibit these six artists present their own implicit altarpieces, each a personal hauntology replacing the priority of being and presence of (mostly) figurative and hyperrealist art with the symbols and shadows of ghosts which are neither present nor absent, neither dead nor alive. Each one, in their own way, questions the safe reality of the present, scratching the patina of our materialistic, techno-futuristic society to unveil the dark mysteries that exist underneath. “Formation” points to how this group of multi-awarded young artists have formed ranks to present their alternative philosophy of art, and their shared darker vision of reality – the spectre Derrida alluded to – the group’s hauntology. As the English Impressionist painter Walter Sickert wrote, “These things are done in gangs not by individuals,” referring to the way groups of artists not only involve a particular style or similarity of content but also on how they introduce their work to the public. In Alter Peace & Formation Ronald Ventura and his group invite viewers to enter the doors of their alternative perception, presenting an exquisite corpus of work, the new altarpieces of a world viewed through a looking glass darkly. Ronald Ventura is one of today’s most acclaimed young Filipino contemporary artists. Ventura has garnered significant international attention in recent years and ranks among the leading new generation artists in Southeast Asia. Famous for his mastery of bravura techniques, he creates hallucinatory paintings of complex layering and unexpected juxtapositions. He has pioneered a pop version of post-surrealism, dissimilar in style but kindred in spirit to the Superflat school of Takashi Murakami. But while the latter dwells primarily on the shallow emptiness of consumer culture, Ventura delves into deeper themes of personal identity. His often startling assemblage of photorealistic images, cartoons and graffiti change in meaning depending on the viewer. To steal an idiom from the Mexican poet Octavio Paz: his oeuvre seems to demand the death of the painter who paints the canvas and births the painter that views it. Ruel Caasi is not a figurative painter. His abstract, metaphysical works explore environmental issues, colour and material studies, as well as deeper themes of existential and phenomenological personal exploration. Caasi in fact started out as a figurative painter, for which he won awards from the Art Association of the Philippines and the National Commission for Culture and the Arts. He had even delved into Social Realism and Installation work before evolving into the world of Abstract Expressionism. The notes for one of his recent exhibits quote existentialist Martin Heidegger vis- à-vis Caasi’s art: “It is, therefore, an essential kind of human awareness that brings us into relation with the nature of our being as human beings who dwell on the earth through that specific recognition and understanding of objects and their relations that we call our world”. His abstract paintings are both the medium and the message through and by which the artist explains his own being and truth in relation to his perception of reality. Eliezer John Cabangon is renowned for his signature hyper-realistic oil paintings rendered in very fine detail and often very vivid colour. Although his style pays much attention to minutiae, his works are never strict interpretations of photographs, nor are they literal illustrations of particular scenes or subjects. Instead, they utilize subtle pictorial elements to create the illusion of a reality which either does not exist or cannot be seen by the human eye. Often his work concern childhood themes of toys and children presented in an almost noir manner, or the pairing of a famous painting or photo with an unexpected commonplace object. The result is often darkly humorous and deeply disturbing. Many of his paintings can be described by that oft-quoted simile from Lautréamont’s Les Chants de Maldoror, they are “as beautiful as a chance meeting on a dissecting table of a sewing machine and an umbrella” and like that great work, the viewer is left with a profound sense of unease. His paintings are like the classic ghost stories of old, inviting the audience into a seemingly harmless place, to learn a secret that they will come to regret. Igan D’Bayan is a writer and visual artist fascinated by misery, destruction, and demonomania. His oeuvre brings the darkest perspective and rawest vision among the six artists represented. Many of his macabre works border on Pop Surrealism, reminiscent of artists from the Los Angeles branch of that movement such as Manuel Ocampo, Camille Rose Garcia, Luke Chueh and Alex Gross. He asserts “when I write, I try to be visual. When I paint, I try to be lyrical… It’s important for artists to read not just art books. When you read literature, you get to know about the human condition and the character of human beings”, adding that his perspective owes more to writers like Thomas Pynchon, Jose Luis Borges and William Burroughs than to other painters and visual artists. Yet as much as his often overtly sexual, post-apocalyptic work exposes a world that has lost is integral cohesion, a slyly incorporated Ralph Steadman-like sense of humour whispers to the viewer that somehow all is not lost. Manok Ventura is a hyperrealist visual artist who draws inspiration from the inescapable cycle of life, death and decay. While most people find this reality of nature less than pleasant, Manok seeks to magnify and exploit it. While decay can certainly be disgusting – as Igan D’bayan has shown with paintings incorporating corpses – he dwells instead on its haunting, philosophical aspects, choosing to portray scenes like a much lived-in old couch left to ruin, abandoned toys and baby prams and broken religious statuary. Manok invites his audience to view decay as the sea slowly etching a beautiful pattern on a castaway piece of metal, creating an aesthetic from the ugly in the vein of Chinese artist Zhang Xiaotao and recalling works by Matthew Barney and Elizabeth Peyton (Blood of Two, 2009) , Dieter Roth (Gartenzwerg, 1972) and Joseph Beuys (Fat Chair, 1964). To paraphrase Derrida, we as the audience must endeavour to speak and listen to the dark spectres intrinsic to these artists’ personal visions, despite our fears and the challenges they may pose to our societal or intellectual traditions. “Or ce qui paraît presque impossible, c’est toujours de parler du spectre, de parler au spectre, de parler avec lui, donc surtout de faire ou de laisser parler un esprit” (Conversing with specters is not undertaken in the expectation that they will reveal some secret, shameful or otherwise. Rather, it may open us up to the experience of secrecy as such: an essential unknowing which underlies and may undermine what we think we know.) The results may surprise us in ways we had not heretofore imagined.